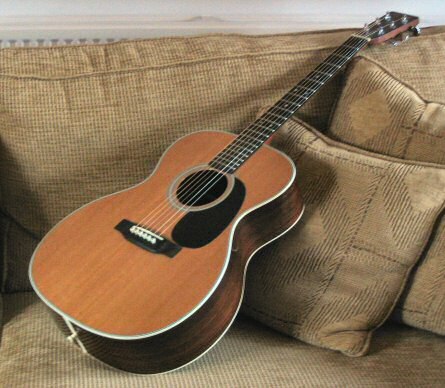 My 000-28 is a guitar I bought in a store in Aberdeen in 2002 and had come out of the factory in Nazareth in the same year. I part traded a non-vintage Gibson J-45 for it at the time. This guitar has a definite “smoky” sound with the complex harmonics characteristic of guitars with rosewood back and sides. There’s a “growl” in the bass and a chimey sound in the treble – an oft-used piece of terminology. It’s a guitar (check at GuitarsJar) that most go to for noodling and trying things out on – very much a guitar to be contemplative with. It appears to lend itself to a darker, moodier turn of musical phrase and sometimes I’ve got to be careful when writing with it that I don’t go down too many wind swept and dimly lit avenues populated with shadowy things that go bump in the night. That notwithstanding, much profitable fun can be had with a 000-28 and a bottle of wine. One thing this guitar is not, is loud. It has a definite ceiling in that department and it doesn’t take kindly to you trying to break through it. That’s not to say that it lacks dynamic range because it can rise from a whisper to it’s full voice very responsively and will bring you plenty of colour, thereby. It’s range of expressiveness is greater, particularly with slower material, than my OM-18V. It’s a heavier guitar than the OM-18V, because of the rosewood, and the low profile neck with the narrower fingerboard and lesser string tension due to the shorter scale (all compared to the OM-18V) would make this an easier guitar for (eg) electric players and those with smaller hands (reputedly). The smell? Wonderful. I could write a paragraph on that alone, but you’ll be glad that I’m not going to. On Interim Reports, this guitar was used for The Spaniard, Apropos Of A Working Day, Mademoiselle, Everybody’s Somebody and Go Down. Mademoiselle‘s the odd-one-out here (being up-tempo) – I recorded it before I had acclimatised to the longer scale and wider ‘board of the OM-18V, which had been a very recent acquisition at the time, and which I probably would otherwise have used for this song. The 000-28, then? A sensitive and complex soul with much to say. I love the way you described your 000-28 and am thinking about getting one for my birthday. Do you still feel the same way about this guiatr after owning it for 6 years (assuming you still have it)? The OOO-28 is an excellent guitar and I was sorry to have to let it go. I’m sure you will be very happy with it if you decide to get it. You might find it a little “quiet” when brand new – play it often and you will find it will blossom and improve month after month and year after year as it “opens-up”. Yes, the OM-28V is a bit special. And your right about the string tension and the scalloped braces. If you drop me a line at dave@dave-keir.com I will reply with some info which you might find of interest should you decide to buy one. I own a 1966 000-28, an instrument of balance and the comfort. Although I have a dreadnaught for when I must project, my 000-28 has a sweetness and ease that endears it to me. The action has not been trucked with, which I like because too easy means less versatile; some kinds of playing cannot occur. Alack, the top has a straight split, evidently because Martin put on the pick guard and shellacked; it isn’t the most pristine table. Moreover, the previous owner from whom I bought it—$650—dinged the top when he dropped the lid of the case on it; but that makes it less intimidating. This previous owner also replaced the neck dots with abalone ones. At least they aren’t too ostentatious. The back is spectacularly figured Brazilian rosewood. It has held up well. All in all, a lovely, modest guitar that I have had for decades. I love its responsiveness.